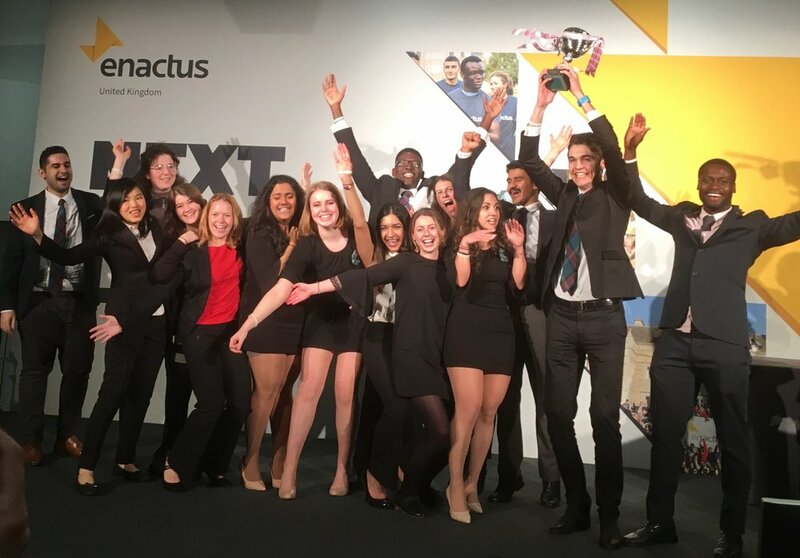 On the 9th and 10th April, the top 32 Enactus teams from across the UK competed in the Enactus UK 2018 National Expo at the ExCeL, London. The dynamic, energy-filled event brought together 700 university students, 70 academics, and over 300 senior UK business leaders across two days in celebration of Youth Social Action and Social Enterprise. Key note speakers included Charlotte Pearce, Enactus Alumna and Founder/CEO of Inkpact, a business that transforms the way companies communicate with personalised handwritten notes, and Julius Ibrahim, Enactus Alumnus and Founder of Second Shot Coffee, who inspired the audience by sharing his story of how his coffee business is having a significant impact and giving previously homeless individuals a second chance and reintegrating them back into society. Enactus teams competed over two days for the title of 2018 Enactus UK National Champion, showcasing their social and community projects to business executives serving as judges. The students were evaluated on how successfully they applied business concepts and an entrepreneurial approach to improve the quality of life of those in need. The final round judging panel comprised of 80 senior business leaders including Lord Dr. Michael Hastings of Scarisbrick, CBE, Global Head of Corporate Citizenship, KPMG International and Peter Holbrook, CEO of Social Enterprise UK. Enactus Edinburgh won the competition after showcasing three of their inspirational social enterprises; Aiding Change, which is providing solar powered hearing aids for those with hearing impediments in Ghana and, Lilypads/Sanitree, two sanitation enterprises which provide reusable sanitary pads for women and girls in Kenya and India. The National event consisted of more than just the national competition and included an Enterprise and Employability Fair with over 20 corporate and social sector partners and a Project Exhibition in which the students showcased their flagship social and community projects. Other competitions included the “Rookie” league for newcomers and the Commercial Innovation competition. Fringe events included an interactive working lunch where Enactus students collaborated with Diageo to help develop one of their social strategies, an EEUK networking event and a leadership competition by Kelly OCG. The winning teams of the sponsored Individual Topic Competitions were also announced amounting to over £92,000 of grants awarded by Enactus UK to university teams this year on behalf of its corporate partners. Enactus Edinburgh will now go on to represent Enactus UK in the 2018 Enactus World Cup in Silicon Valley, USA in October this year.